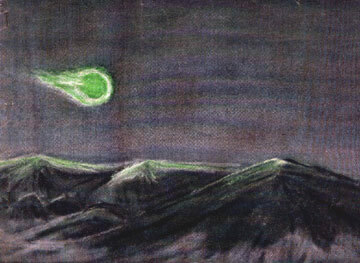 This is a scrupulously accurate eyewitness painting of a mysterious green fireball rushing through the night sky over New Mexico. It was done by Mrs. Lincoln LaPaz, wife of an authority on meteors. Both she and her husband have observed the fireballs first hand. The Air Force is now ready to concede that many saucer and fireball sightings still defy explanation; here LIFE offers some scientific evidence that there is a real case for interplanetary saucers. For four years the U.S. public has wondered, worried or smirked over the strange and insistent tales of eerie objects streaking across American skies. Generally the tales have provoked only chills or titters, only rarely, reflection or analysis. As a result of continuing flying saucer reports the Air Force maintains constant intelligence investigation and study of unidentified aerial objects. A policy of positive action has been adopted to find out, as soon as possible, what is responsible for observations that have been made. As a part of this study, military aircraft are alerted to attempt interception, and radar and photographic equipment will be used in an attempt to obtain factual data. If opportunity offers, attempts will be made to recover such unidentified objects. Already all operational units of the Air Force have been alerted to report in detail any sightings of unidentified aerial objects. Other groups -- scientists, private and commercial pilots, weather observers -- all trained observers whose work in any way concerns the sky, and what happens in it, are urged to make immediate reports to Air Technical Intelligence Center at Wright-Patterson AFB, Dayton, Ohio of any unidentified aerial objects they sight. Further, for the first time since Project "Saucer" was changed from a special-type project to a standard intelligence function, in December 1949, the Air Force invites all citizens to report their sightings to the nearest Air Force installation. All reports will be given expert consideration and those of special interest will be thoroughly investigated. The identity of those making such reports will be kept in confidence; no one will be ridiculed for making one. There is no reason as yet to believe that any of the aerial phenomena commonly described as flying saucers are caused by a foreign power or constitute a clear and present danger to the U.S. or its citizens. These disclosures, sharply amending past Air Force policy, climaxed a review by LIFE, with Air Force officials, of all facts known in the case. This review has resulted from more than a year of sifting and weighting all reports of unexplained aerial phenomena -- from the so-called flying saucers to the mysterious green fireballs so often sighted in the Southwest. This inquiry has included scrutiny of hundreds of reported sightings, interviews with eyewitnesses across the country and careful reviews of the facts with some of the world's ablest physicists, astronomers, and experts on guided missiles. For the first time the Air Force (while in no way identifying itself with any particular conclusions) has opened its files for study. 1. Disks, cylinders and similar objects of geometrical form, luminous quality and solid nature for several years have been, and may be now, actually present in the atmosphere of the earth. 2. Globes of green fire also, of a brightness more intense than the full moon's, have frequently passed through the skies. 3. These objects cannot be explained by present science as natural phenomena -- but solely as artificial devices, created and operated by a high intelligence. 4. Finally, no power plant known or projected on earth could account for the performance of these devices. Let us first review some widely known facts. The shapes and inscrutable portents of the flying disks first broke upon the skies of the world in the early months of 1947, with several sightings reported to the Air Force. The story first reached the nation on June 24, 1947, when a private pilot named Kenneth Arnold was flying from Chehalis to Yakima, Wash. Some 25 miles away, Arnold saw nine "saucer like things ... flying like geese in a diagonal chainlike line," approaching Mount Rainier. They swerved in and out of the high peaks at a speed Arnold estimated to be 1,200 mph. Arnold told the whole story to his hometown newspaper, and like summer lightning it flashed across the country. Within a month, saucers had been reported by people in 40 states. For the public (as LIFE itself merrily reported in its issue of July 21, 1947) he saucers provided the biggest game of hey-diddle-diddle in history. Any man, woman, or child with talent enough to see spots before his eyes could get his name in the newspaper. Nevertheless in serious moments most people were a little worried by all the "chromium hubcaps," "flying washtubs" and "whirling doughnuts" in the sky. Buried in the heap of hysterical reports were some sobering cases. 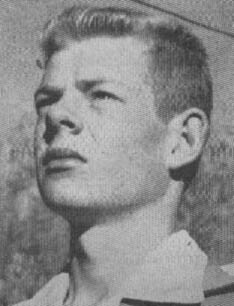 One was the calamity that befell Air Force Captain Thomas F. Mantell on Jan. 7, 1948. That afternoon Mantell and two other F-51 fighter pilots sighted an object that looked like "an ice-cream cone topped with red" over Godman Air Force Base and Fort Knox, Ky. Mantell followed the strange object up to 20,000 feet and disappeared. Later in the day his body was found in a nearby field, the wreckage of his plane scattered for a half mile around. It now seems possible that Mantell was one of the very few witness's who actually were deceived by a Skyhook balloon, but the incident is still listed as unsolved by the Air Force files. There was no such easy explanation for the strange phenomenon observed at 2:45 a.m. on July 24, 1948 by two Eastern Air Lines pilots. Captain Clarence S. Chiles and Copilot John B. Whitted were flying in bright moonlight near Montgomery, Ala. when they suddenly saw "a bright glow" and a "long rocket like ship" veer past them. They subsequently agreed that it was a "wingless aircraft, 100 feet long, cigar-shaped and about twice the diameter of a B-29, with no protruding surfaces, and two rows of windows ... From the sides of the craft came an intense, fairly dark blue glow ... like a fluorescent factory light." They said the weird craft "pulled up with tremendous burst of flame from the rear and zoomed into the clouds at about 800 miles an hour," rocking their DC-3 with its "prop or jet wash."
Just as inexplicable was the experience of Lieutenant George Gorman of the North Dakota Air National Guard. On Oct. 1, 1948 Gorman was coming in at dusk to land his F-51 at Fargo, when he saw an intense, bright light pass 1,000 yards away. Curious, Gorman followed the light and saw that it seemed to be attached to nothing. For 27 hair-raising minutes Gorman pursued the light through a series of intricate maneuvers. He said it was about 6 inches in diameter and going faster than his F-51 (300-400 mph). It made no sound and left no exhaust trail. After Gorman landed, the light having suddenly flashed away in the upper air, he found support for his story -- the chief of the control tower had followed the fantastic "combat" with binoculars. The occurrences, jarring though they must have been to the participants, left the official calm of the Air Force unruffled. The project set up to investigate the saucers ("Project Sign," known to the press as "Project Saucer") seemed to have been fashioned more as a sedative to public controversy than as a serious inquiry into the facts. On Dec. 27, 1949, after two years of operation, Project Saucer wrote off all reports of unidentified aerial phenomena as hoaxes, hallucinations or misinterpretations of familiar objects -- that is, all but 34. These stubborn 34, seemingly unexplainable, were briskly dismissed as psychological aberrations. While these assurances appeased most of the press and pacified the public, some elements in the Air Force just about this time began to worry a bit more seriously. Saucer reports continued to come in a rate of about one a day and were handled under the code name of "Project Grudge." Officers at policy level began to show concern. "The higher you go in the Air Force," conceded one Intelligence officer, "the more seriously they take the flying saucers." There was good reason to be serious. As review of all records has shown, these years have produced literally dozens of incidents defying simple explanation -- and provoking the most incredible questions. Checked and rechecked, 10 cases out of the formidable list on record are here presented in essential detail. Of these, three wee discovered in the course of LIFE's own investigation and are reported for the first time. The Lubbock Lights, flying in formation, are considered by the Air Force the most unexplainable phenomena yet observed. These photographs (only one shown above) were made at Lubbock, Texas, on August 30th, 1951 by Carl Hart, Jr. Scientists say lights were not natural objects, but they traveled too fast and too soundless for known machines. At 9:10 p.m. on August 25, 1951, Dr. W. I. Robinson, professor of geology at the Texas technological College, stood in the back yard of his home in Lubbock, Texas and chatted with two colleagues. The other men were Dr. A. G. Oberg, a professor of chemical engineering, and Professor W. L. Ducker, head of the department of petroleum engineering. The night was clear and dark. Suddenly all three men saw a number of lights race noiselessly across the sky, from horizon to horizon, in a few seconds. They gave the impression of about 30 luminous beads, arranged in a crescent shape. A few moments later another similar formation flashed across the night. This time the scientists were able to judge hat the lights moved through 30 degrees of arc in a second. A check the next day with the Air Force showed that no planes had been over the area at the time. This was but the beginning: Professor Ducker observed 12 flights of the luminous objects between August and November of last year. Some of his colleagues observed as many as 10. Hundreds of nonscientific observers in a wide vicinity around Lubbock have seen as many as three flights of the mysterious crescents in one night. On the night of August 30 an attempt to photograph the lights was made by 18-year old Carl Hart Jr. He used a Kodak 35-mm camera at f 3.5, 1/10 of a second. Working rapidly, Hart managed to get five exposures of the flights. The pictures exhibited by Hart as the result of this effort show 18 to 20 luminous objects, more intense than the planet Venus, arranged in one or a pair of crescents. In several photographs, off to one side of the main flight, a larger luminosity is visible -- like a mother craft hovering near its aerial brood. Carl Hart, 18-year-old student, photographed the Lubbock Lights with Kodak 35. 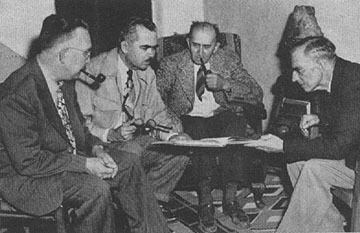 Professors at Texas Tech who saw Lubbock Lights (left to right), Dr. Oberg, Professor Ducker, and Dr. Robinson, discuss them with Dr. E. L. George.